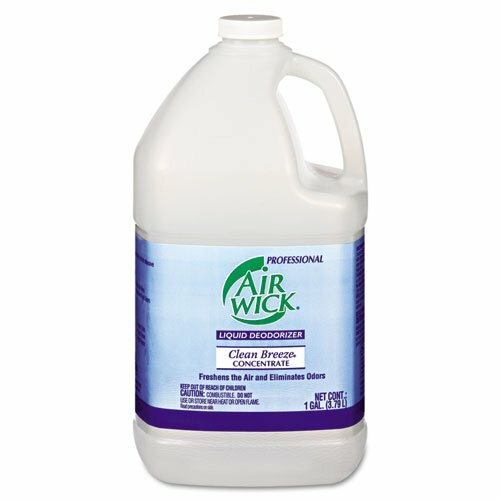 Air Wick Professional Liquid Deodorizer, Clean Breeze Scent, Concentrate, 1 gal - Includes four per case. View More In Air Fresheners. Freshens the air and eliminates odors from cigarette and cigar smoke, mold and mildew, gym, drain, bathroom and cooking. Concentrated formula makes up to 24 gallons. Scent: Clean Breeze; Physical Form: Liquid; Application: Odor Control; Capacity (Volume): 1 gal. Freshens the air and eliminates odors. Concentrated formula makes up to 24 gallons. Helps control cigarette and cigar smoke, mold and mildew, gym, drain and bathroom and cooking odors. If you have any questions about this product by Air Wick, contact us by completing and submitting the form below. If you are looking for a specif part number, please include it with your message.